Home » New ECO-FRIENDLY line of products. The industry is “going back to the roots” and DGS, conscious of the environmental impact of the graphics production, offers now a complete line of rigid and flexible materials compatible with Eco-Solvent, UV and Latex inks. Thanks to strategic partnerships with US manufacturers, Executive Printers now expand its product line to satisfy today’s printer needs. This is a great environmentally friendly option to using foam board or coroplast. Also it costs much less! • Falconboard™ Structural (Honeycomb) graphic board. • Converdboard® MR Micro-corrugated white paper rigid board. 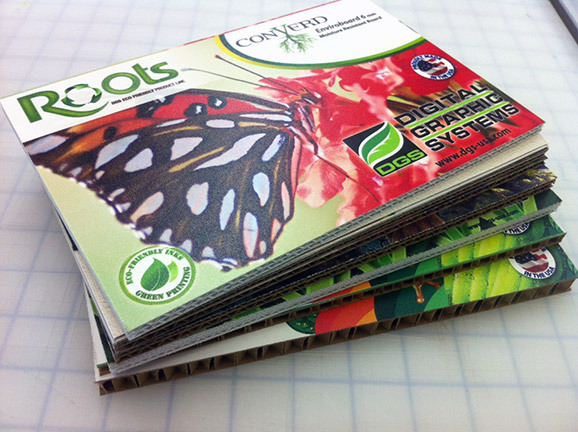 • EcoBoard™ Corrugated cardboard for UV printing. • GreenLight™ Plus! Backlit Paper. • Blox-Lite™ Double sided block out banner. • Blox-Lite Chrome™ Double sided block out banner with chrome finish. • EnviroScape Mural™ Water activated adhesive paper. • EnviroScape Mural Texrured™ Water activated adhesive textured paper. • GREEN PE Banner™ PVC free banner. • GREEN PP Paper™ Polypropylene tear resistent synthetic paper.